NASA will hold a press conference Monday (June 11) to discuss plans for its huge Curiosity Mars rover, which is cruising toward an early August landing on the Red Planet. The 1-ton Curiosity rover — the centerpiece of NASA's $2.5 billion Mars Science Laboratory (MSL) mission — is due to touch down near Mars' Gale Crater on the night of Aug. 5. The car-size robot blasted off from Florida's Cape Canaveral Air Force Station on Nov. 26 and is now about three-quarters of the way through its eight-month journey through deep space. Pete Theisinger, MSL project manager, Jet Propulsion Laboratory, Pasadena, Calif.
John Grotzinger, MSL project scientist, California Institute of Technology, Pasadena, Calif. Curiosity's main goal is to determine if the Gale Crater area is, or ever was, capable of supporting microbial life. To get at this question, Curiosity will take a variety of geological and geochemical measurements with its 10 science instruments. MSL scientists will analyze this information in an effort to understand the evolution of Gale and Mount Sharp, the mysterious 3-mile-high (5 kilometers) mound rising from the crater's center. The rover's prime mission is slated to last about two Earth years. 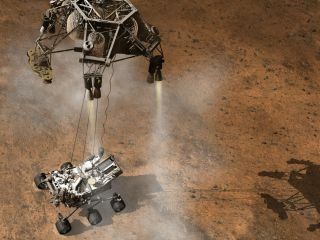 But before Curiosity can explore the Martian surface, it will have to land safely. Landing a robot on the surface of another world is always challenging, and Curiosity's touchdown may be more anxiety-inducing than most. Because Curiosity is so heavy, the MSL team had to come up with an entirely new landing method for the rover. A rocket-powered sky crane will lower the massive robot to the Red Planet surface on cables, then fly off and intentionally crash-land a safe distance away. The sky crane has performed well in simulations, MSL team members have said, but the technique has never been used before to land a rover on another world.